KEY CONCEPT: Exploring statistics and graphs. DESCRIPTION FROM THE PUBLISHER: More than 250 years ago, William Playfair was a dreamer who saw the world differently from other people. Early on, he attempted to apply his unique perspective to a series of career opportunities, although unfortunately only resulted in failure. 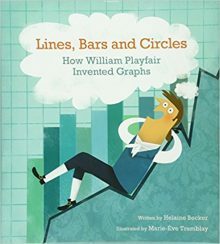 Then, while writing a book about economics, Will’s innovative vision inspired an idea that would set him apart: he created the first modern line graph. These infographic inventions provided a way for numbers to be seen as pictures, which made them easier to understand and to remember- thus changing the way the world would interact with data forever.